The Federation often employs concealed "duck blinds" in anthropological studies of pre-warp civilizations. 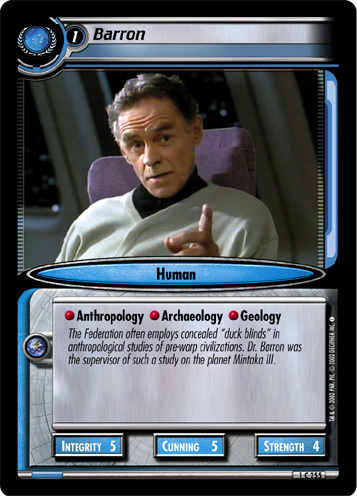 Dr. Barron was the supervisor of such a study on the planet Mintaka III. Characteristics: affiliation, Earth related, Human species. There are 11 entries for Barron (ST2E 1 C 255) at the Tradeplace (28 haves and 2 wants). Click here to see all trade list entries for this Common card!